OTTAWA — A former Conservative MP says Prime Minister Stephen Harper didn’t call an open nomination meeting in Labrador because he feared party members would pick a candidate whom he cannot control. Penashue resigned last week, months after Elections Canada found his campaign had accepted tens of thousands of dollars in illegal donations. Penashue, who was also accused of accepting free flights around the large, remote riding during the writ period, defeated the Liberal incumbent, Todd Russell, by just 79 votes in 2011. Last Thursday, before Elections Canada had a chance to complete its investigation into his campaign expenses, Penashue announced that he would run in a byelection. Conservative Party members in Labrador, however, will not have a say in selecting their candidate — Penashue won’t be competing against anyone for the party’s nomination. The Conservative Party’s National Council “unanimously” decided Friday night to appoint him as the candidate, spokesman Fred DeLorey confirmed. “We stand by Peter Penashue. He is doing the right thing in being accountable to the voters who elected him. Mr. Penashue has represented and delivered for the people of Labrador in numerous areas,” DeLorey wrote in an email. “It is the people of Labrador who will make the decision on this matter. 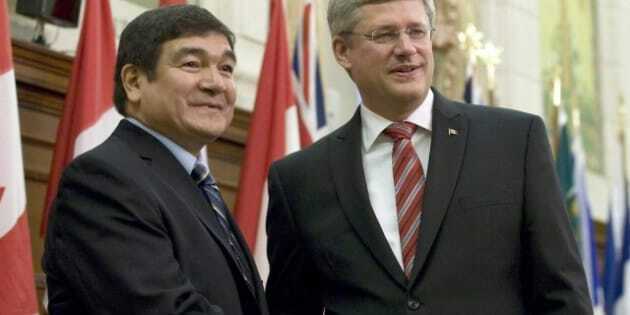 Minister Penashue will be accountable to the people of Labrador,” the prime minister said. Despite preaching openness and democracy, Mark said, the Conservative Party under Harper is anything but open or democratic. Mark, who came to Ottawa in 1997 as a Reform Party MP from Manitoba, said the party used to be staunchly in favour of open nominations. Back in the summer of 2006, after the Conservatives had won a minority government, several MPs came forward saying they feared facing tough nomination battles at home while the party expected them to be in Ottawa. The Conservative Party executive director at the time, Mike Donison, wrote a letter reminding all members that open nominations were a key principle of the party. “On June 18th.. The Party clearly stated … that unlike the Liberal Party, our Party was committed to the principle that all ridings, including those held by sitting Conservative Members of Parliament should be open for nomination and that there was to be no automatic re-nomination of those sitting MP’s,” Donison wrote, noting that democratic requirement in the Conservative Party’s constitution. A few years later, Conservative Party executives changed the rules to ensure that two thirds of riding members had to vote in favour of an open nomination for such a contest to be held. That rule was revoked after the last election, DeLorey said. Now, the Conservative Party’s constitution sets out a process for candidate nomination committees in each electoral district, but the National Council reserves the right to make appointments. “As far as the party goes, they are all supposed to be open and honest nominations, but that isn’t always the case,” Mark said. Even though he ran five times, he said he had to defend his record three or four times in open nomination meetings. The Conservative Party is already advertising Penashue’s candidacy. It took out a full page ad Monday in The Labradorian trumpeting Penashue’s record of securing the support for the billion-dollar Muskrat Falls project, increasing Internet speeds in Labrador and defending the seal hunt against "Liberal and NDP parliamentarians who want to ban it." (A handful of Liberals have spoken out against parts of the hunt). Until a byelection date is announced, the Conservative Party can advertise on Penashue’s behalf without the spending counting towards any campaign expenditure limits. Under Elections Canada rules, Harper cannot announce the date of the writ until March 29. The byelection can’t be held earlier than May 6, and a date must be announced by Sept. 14. A source close to Penashue told The Canadian Press on Monday that a byelection will be called in the next two weeks, with a vote in mid-May. Calls to Penashue’s campaign office in Labrador were rerouted to Ottawa, where Chad Bowie, a Conservative party staffer in charge of political operations for Atlantic Canada, refused to answer any questions and hung up the phone. CORRECTION: An earlier version of this story reported that Penashue lost in Labrador to Liberal incumbent Todd Russell by 79 votes in the 2011 election. Penashue defeated Russell by 79 votes.